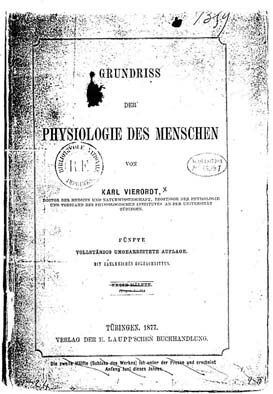 [As far as we know Karl VIERORDT, professor of physiology at the University of Tübingen, is the first physiologist who made posturographic recordings. He wrote a handbook of physiology the chapter 23 of which deals with standing posture and local movements. An English translation of the paragraph dealing with standing posture is given below, but you can read the German original text if you prefer. 500. Centre of mass of the body. Ed. 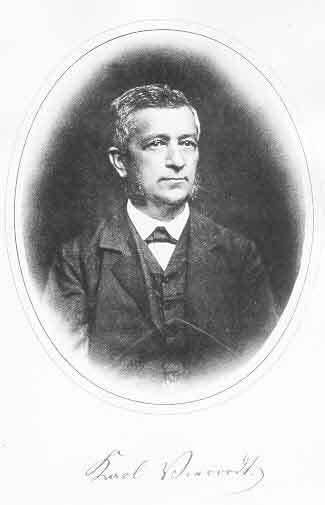 Weber, having defined the centre of mass of the board, moved subject on the board as much as needed to establish balance. Centre of mass is situated on the vertical line sw, which passes by the promontory. By a similar process on a corpse, legs of which had been split, the height of the centre of mass of the trunk was determined. It falls in the low part of the breastbone, at the level of the xiphoïde apophyse, towards the spinal column (plane a). Consequently, the centre of mass of the trunk is situated well over the axis of rotation of the femoral heads. If it is admitted that during standing quiet (see 503), the trunk oscillates on both femoral heads, the centre of mass of the trunk must fall in the neighbourhood of the centre of the distance between the two femoral heads, centre which corresponds to the anterior edge of the big trochanter (plane b). This plane b is defined in an approached way when on each side of a person standing upright, a plumb line is suspended which passes at the anterior edge of trochanter. This plane b cuts the apophyses mastoids of the temporal bones. If a vertical line is drawn in this plane b, with symmetric parts of the body at equal distance on its right and left hand side, then this vertical line cut the plane a in a point which is the centre of mass of the trunk. This one is situated between the xiphoïde apophyse and the eighth dorsal vertebra, at a distance of about five centimetres from this last one (Ed. Weber). 501. Stiffening of the leg. Problems put by the preservation of standing posture are above all problems of stability (oscillations of the body as reduced as possible), of stamina and comfort of the position. Among very varied manners to stand up, the most functional are those that satisfy these criteria best. So that the leg carries the weight of the body without fatigue, it has to change in a stiff support and the centre of mass of the body has to take place almost upright of the joint of this foot. (1) By a muscular contraction. In these conditions the mobile parts of the leg can be maintained stiff and take very different angular positions each other. But such a posture can have only in a temporary way, because muscles get tired very fast. We shall not study up this posture which is not natural. (2) By other means that the force of muscles. Certain joints are maintained at their most extension by a movement of the centre of mass of the trunk outside the vertical line of the rotation axis of the concerned joint and in a direction that provokes the extension of this last one. This very precise, particular position can be maintained during a long duration (Ed. Weber). So, two skeletal parts usually mobile in relation to each other establish among them a stiff connection. All the joints of the leg, with the exception of the joint of the foot, can be stiffened in this way during standing posture; consequently the trunk and the stiffened leg hold up in balance on the astragal. To study the degrees of stability of the various sorts of standing posture, Vierordt uses a simple graphic process. The head, maintained immovable on the trunk, wears at the vertex a vertical paintbrush that, during a defined time and according to the oscillations of the body, draws a figure of a certain shape and a certain size on a glass patch covered with soot and fixed horizontally over the head. Devices to record these physical oscillations would be indispensable to penetrate into the physiology of standing posture. 502. Stabilisation of the leg. Unstable position of the stiffened leg on the astragal is not an inconvenience (as it is usually thought, so that means which could make this joint stiff are looked for) but an essential advantage for standing posture, provided that we have a system which not only warns us when balance is being broken, but which allows us to restore balance at once thanks to a small muscular effort (Vierordt). All of us are aware of the position of parts of our body thanks to common sensations passed on through our muscles. By their swaying on the astragal during standing posture, all parts of our body carry out concordant movements, that is to say concentric and passive, which by their multiplication bring about muscular sensations that become more and more harmonious and accurate. These sensations, all the more fine as muscular fatigue is more reduced, inform us immediately about our losses of balance. These sensations, which can be called «sensations of balance and/or sensations of loss of balance» have a specific nature as many of the other muscular sensations. Among numerous patients, and particularly during diseases of nerve centres, they show the most varied abnormalities, collected under the common name of «dizziness», from which results insecurity for walking and even for standing posture in these cases. During swaying, the various parts of the skin of feet sole are compressed differently as a result of the local variations of loads. At the same time pressure increases in certain places and decreases in other places of the skin of the same sole, as during standing up at ease unevenly on our two feet, sometimes the right foot, sometimes the left foot, bears the load. The arch of the foot, that is to say its uprising between defined places (heel bone, heads of the first and the fifth metatarsal), favours the acuteness of sensations from the skin of feet sole. If we fix an immobile object, then we are informed at once about the oscillations of our body thanks to the fact that we notice the modifications of position of the fixed object with regard to the background. If tactile sensibility of the skin of feet sole is decreased by bathing feet in cold water then the body sway increases in an important way (Heyd). Performances of the sense of sight for the detection of losses of balance are much lesser than those of the two other means first quoted. We can stand up safe in darkness or blindly, however the body sway is more important than with eyes open. During standing posture on a single foot this means of help intervenes in a more remarkable way. Finally eye is indispensable for standing quiet or for walking during impairments of the spinal cord, as tabes dorsalis. As we said first, standing quiet requires that the leg, which carries the weight of the body, is stiff, without any muscular effort at the level of the knee and of the hip. The different manners to stand quiet can be separated in two groups. Standing at ease («Position hanchée», in French in the text; German language has no word to designate this position, the most common). The leg carrying alone the weight of the body is extended and the centre of mass of the body is straight up the instep of this leg (we shall admit that for the moment), so the trunk is a little tilted towards this leg. Then the other leg rests slightly on the ground, rather in front of the support leg, furthermore it is slightly bent at the level of the knee joint and of the hip. So it does not carry the weight of the body. The centre of mass of the body is not on the side of this slightly rested leg. Weak extensions of this last one at the level of the knee immediately insure balance if it is threatened. The main postures that we are not going to study up, are determined by 1) The angle which the longitudinal axis of two feet form among them, 2) distance between two legs. 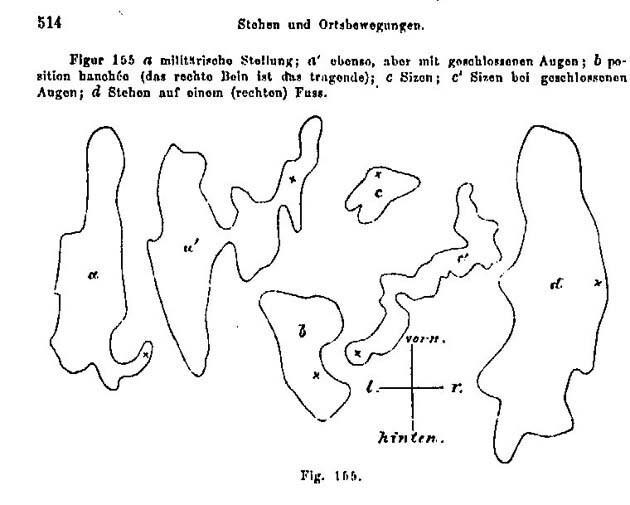 According to Schweinfurth, «Nuers of the gazelle river» (?) stand up on a leg during hours without moving, as swamps birds, and during this time, the foot sole of the other lower limb is pressed on the knee. Their members are strikingly long and slender. Standing posture on two legs. In that case the symmetric parts of the body are situated at equal distance of the median vertical line which separates the body in two halves, right and left. This way of standing can also be called «symmetric» in opposition to the asymmetric postures of the first group. Among various possible positions, which depend notably on the importance of the space between the legs and on the angle that the two feet form, only the stiff military position must be retained. This way of standing asks for a support balanced on the two plantar soles; a well-balanced distribution of the weight of the body on the two legs, transformed into stiff supports at the level of the knee and hip joints; a position of the body centre of mass - with regard to the ground - straight up the area limited by the two feet. (4) The one during that balance can be restored as quickly as possible and with the minimum of energy expenditure. (3) the one that is chosen in a general and arbitrary way by people (because organised with the least important effort). (1) A bigger stiffness of the support leg at the level of the knee and of the hip, because the pressure of the weight of the trunk goes almost exclusively on this leg. These two joints are almost completely at most of their extension. (2) In the symmetric posture, notably the calf muscles prevent the forward's fall of the body, and as that could fold knees; the tendons of knees have also to act at once. But for the not symmetric posture, the calf muscles of the support leg are much less tense and those of the leg weakly rested are not at all tense, because a) the second leg is placed a little forward and so prevents the body from falling forwards; b) the action of the second leg results only from a light contraction of the tendons of the knee. (3) In the symmetric posture, the insertion point of the calf muscles, which prevent the body from falling forwards, are relatively close to the instep. On the contrary the asymmetric position presents the big advantage that the second leg, when it tightens at the level of the knee to retain the body from hanging forwards, has its attack point at a high level (in the hip joint) that is very remote from the instep, so that the muscular contraction which restores lost balance acts on this big arm of control lever in much more advantageous conditions. (4) During the asymmetric posture, the leg which does not bear the weight of the body exercises a very reduced pressure on the ground; at the beginning of the fall of the body, pressure on the ground necessary to restore balance was only 6/8 kilograms (Vierordt). So this leg can press on the ground with a weight lower than its own weight; in other words the muscle structure (extensors of knees) which restores lost balance works with a small load, in the symmetric posture on the contrary, the muscle structure of calves has a much more important load. (5) In an asymmetric posture, the sensation of pressure at the level of the plantar sole of the leg, which does not carry, has a determining advantage. As (according to 4) the pressure of this leg on the ground is very reduced, it is increased in a relatively significant way by the least imbalance, what cannot be the case in the symmetric posture. As, according to E. H. Weber, we can perceive differences of pressure of 1/40, (335), the very beginning of a body imbalance must be felt at once by the skin of the plantar sole of the not support leg. (6) The sensations for balance which result from muscles are favoured by the not symmetric posture because muscular effort is very reduced on the not support side. (7) In the not symmetric posture, postural sway is clearly reduced. Figure 155. a: military posture; a': the same but with eyes closed; b: standing at ease (the right leg being the support leg); c: sat; c': sat with eyes closed; d: standing on only one foot (the right foot here). The figure 155 represents several attempts for measuring body sway at the vertex, according to the method indicated in the note 501, during various postures. The asterisk (*) indicates the starting position of the paintbrush. Recording duration 3 minutes and if it was prolonged, the advantages of the asymmetric posture were more visible.